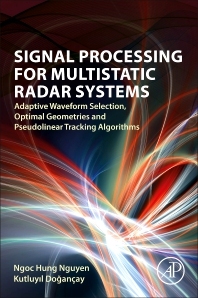 Signal Processing for Multistatic Radar Systems: Adaptive Waveform Selection, Optimal Geometries and Pseudolinear Tracking Algorithms addresses three important aspects of signal processing for multistatic radar systems, including adaptive waveform selection, optimal geometries and pseudolinear tracking algorithms. A key theme in the book is performance optimization for multistatic target tracking and localization via waveform adaptation, geometry optimization and tracking algorithm design. Chapters contains detailed analyses of mathematical derivations and algorithmic development that is accompanied by simulation examples and associated MATLAB codes. This book will be ideal for university researchers and industry engineers in radar, radar signal processing and communications engineering. Ngoc Hung Nguyen received a B.E. (Hons.) degree in electrical and electronic engineering from the University of Adelaide, Australia, in 2012 and a Ph.D. degree in telecommunications from University of South Australia, Australia, in 2016. Since February 2016, he has been with the Institute for Telecommunications Research, University of South Australia, where he is currently a research fellow. His research interests span statistical and adaptive signal processing.